In order to maintain the interest of your clients and to more importantly keep them posted with additional information for ongoing or future promotions PrestaShop 1.6 provides you with the option to run a newsletter. The feature is quite easy for maintaining and in the next few lines of this tutorial we will provide more information on how you should be able to take benefit from it. 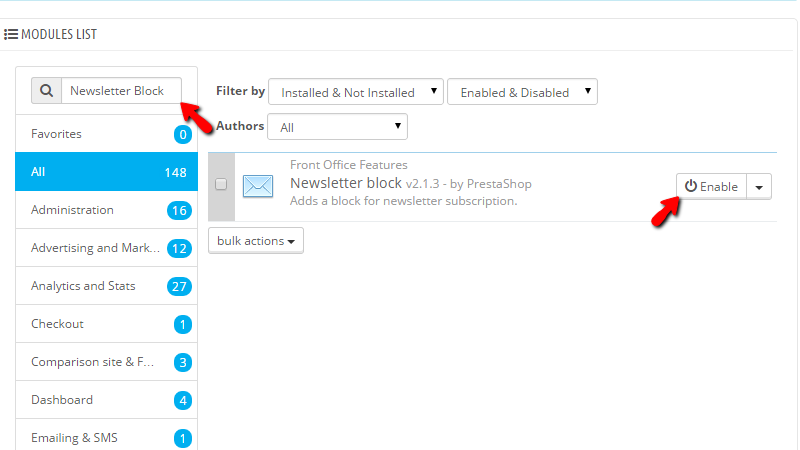 By default you will find the newsletter block enabled on your store. 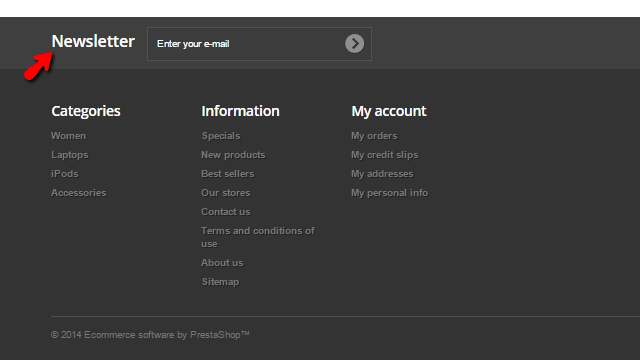 That is quite normal as the sample data PrestaShop 1.6 uses requires the feature to be activated. You can find it in the footer of your website. The block will provide all the users you have on your website with the option to subscribe to your newsletter so you can send those users mail regularly when there are any special promotions they can take advantage of. In case the block is disabled for some reason and respectively there is no option for your users to subscribe for the newsletter of your website, you will need to enable it. The process is fairly simple. 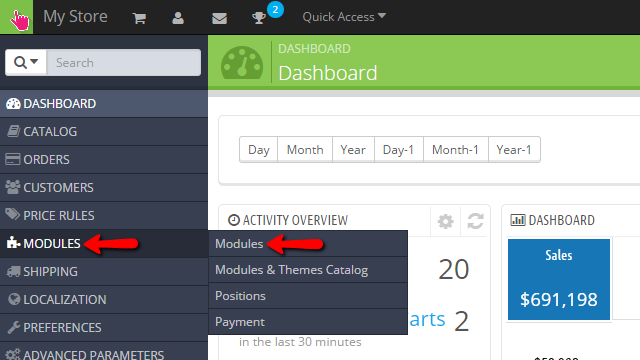 First you will need to access the Modules section of the Back Office. Then you will need to simply search for the Newsletter Block string using the Search feature provided in the Modules List interface. Once you find the module you should simply enable it using the Enable button and it will automatically prompt on the home page of your website. In order to configure the activated module you should simply press on the Configure button when you search for the module again as the outlined action in Step 1. Once you are ready with those settings please use the Save button so these can be saved and you are done with the configuration of the module. Congratulations! 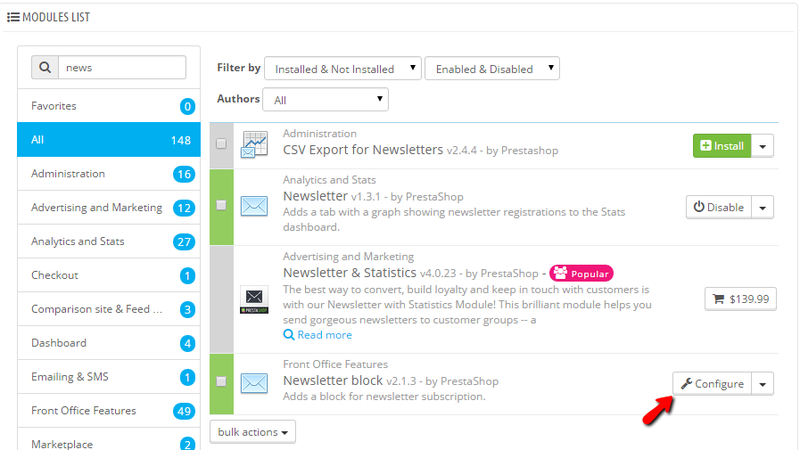 You can now fully use the newsletter block functionality of your PrestaShop 1.6 based Store!